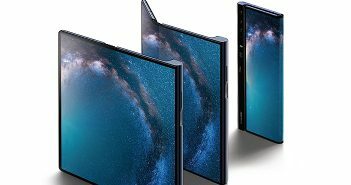 We have entered an era where we see new smartphones launching day in and day out. A smartphone that you bought 12 months back will look outdated today. 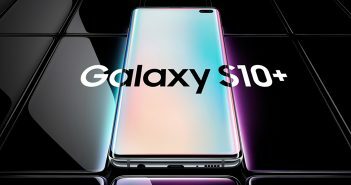 If you are wondering why then it is mainly because of the new features and specifications that we see on the smartphones from the latest mobiles price list. 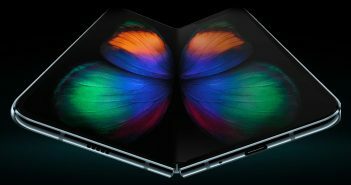 In all honesty, not many of us would prefer using a smartphone for more than a year or two at the max. When you plan on buying a new smartphone, it is always better to sell your used phone to save extra cash. 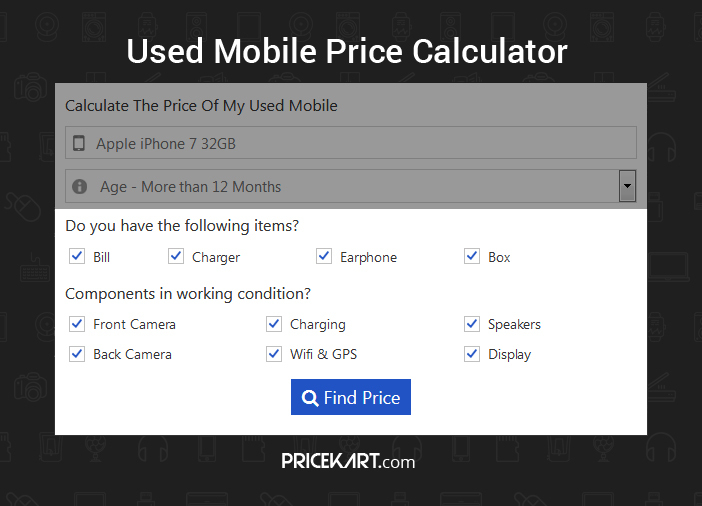 To help you find the best price of your used phone, Pricekart recently introduced its ‘Used Mobile Price Calculator’. This price calculator considers various factors such as working components, the age, and the real-time price of the phone to give you an approximate price of your used phone. This system uses trusted algorithms and machine learning to offer you the best price. 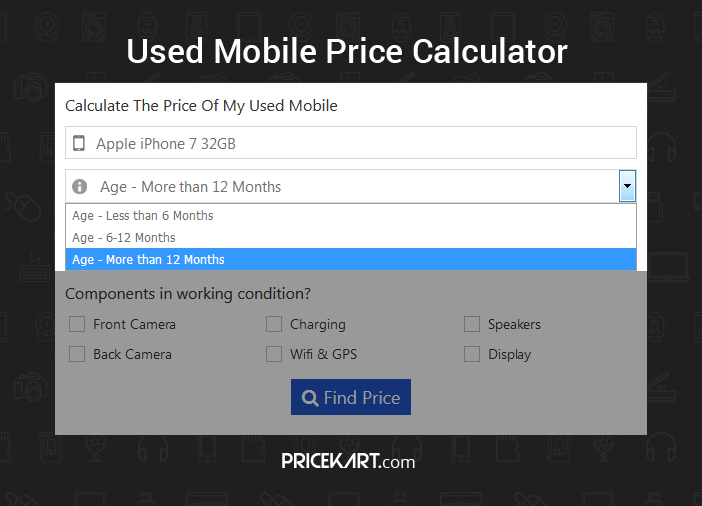 Let’s take a look at how this used mobile price calculator works along with relevant screenshots. In a few simple steps, you can determine the price of your used phone. 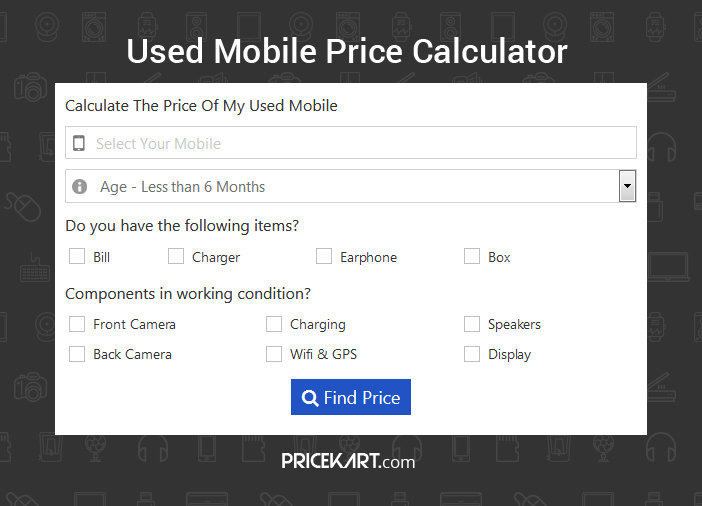 The used mobile price calculator will determine the price of your used phone by calculating the age, working components and the available items. Following is the step by step process for calculating the price of a used Apple iPhone 7. Step 1 is to type in the mobile model that you are currently using or the mobile you want to sell. Make sure that along with choosing the model, you are also choosing the right storage variant as the price may differ based on the variant. In our screenshot above, we have opted for the Apple iPhone 7 32GB variant. In the screenshot, we have selected the age –more than 12 months. In this step, tick off the items such as bill, charger, earphone and box, that are available with your used phone. Remember that the price of your used phone may vary depending on the availability or non-availability of the above-mentioned items. Only tick off the items that are running smoothly and are in a working condition. In case any of the above-mentioned components are missing, do not tick the box. 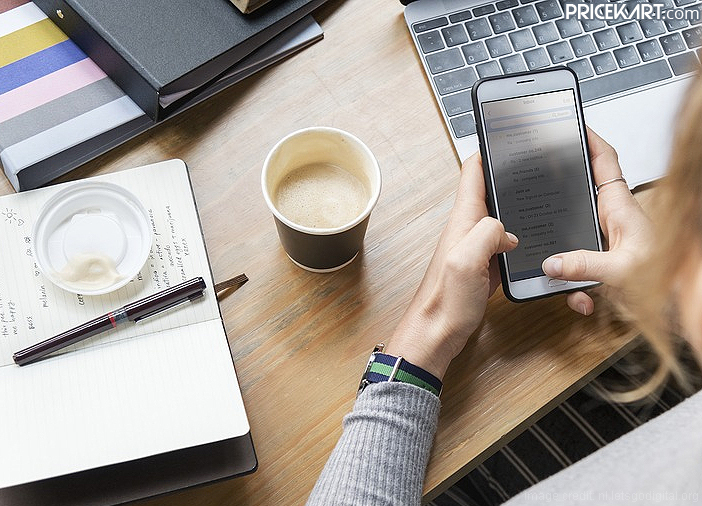 Once you are done with these steps, click on the ‘Find Price’ button to get the best price of your used phone. 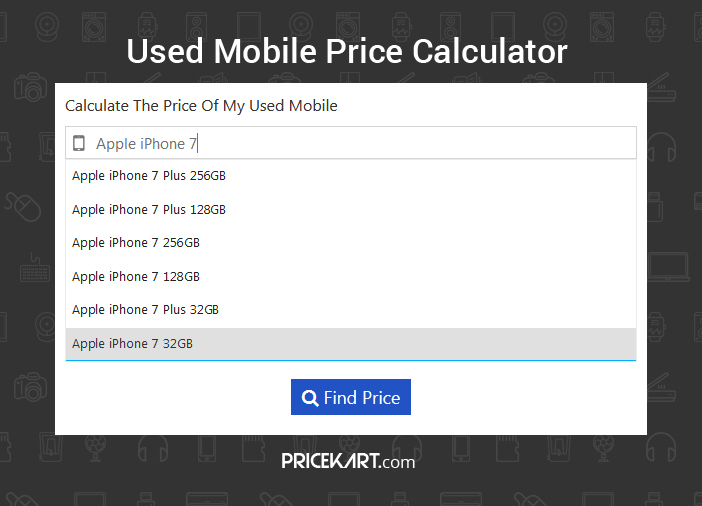 The used mobile price calculator can calculate the price of every smartphone from the mobiles price list in India.